As I was waiting in CVS one day for a prescription to be filled I wandered around the store. I had about 20 minutes to kill and thereâ€™s not much else to do in CVS but look around. 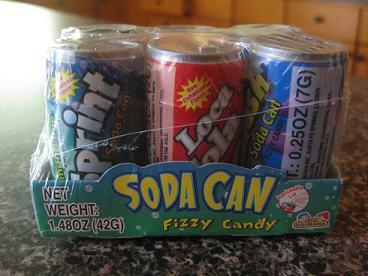 Thatâ€™s when I found this little six pack of Soda Can Frizzy Candy. The six-pack is a cute little novelty and there are four flavors: lemon-lime, cola, orange and grape. I’m not really a huge fan of fruity sweets and when I think of candy, I think of chocolate. 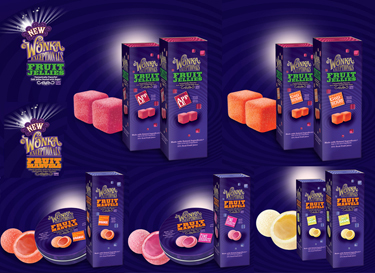 So, after I devoured and finished up the review of Wonka Exceptionals chocolate bars, I turned to the Fruit Marvels and Fruit Jellies. I can definitely say they are unlike anything else I’ve ever eaten. I love a good gift as much as the next person. However, I really prefer functional gifts. Not that I don’t appreciate the thought, but how many basket-fulls of perfumed lotion can one person stand?! Well, Ooh La La Candy is the answer to gift giving. A sweet sentiment (pun intended) AND a tasty treat makes for a good gift. How can you go wrong with popular candy mixed with some good design/packaging? Given my predilection for useful gifts, it is needless to say that I was looking forward to seeing if Ooh La La Candy could meet my gift-giving needs. I quickly noticed the dual purpose of the “cupcakes”. Gift + sustenance! The cupcakes are crafted from candy which means one of my favorite things is being made from one of my other favorite things! 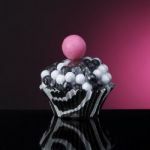 The Sweet Stripes cupcake consists of black and white Sixlets (who doesn’t like Sixlets??) and is topped with a giant pink gumball. (Be forewarned, the anticipation will surely build because the packaging of the little cupcake is a bear to get into! They are securely attached to their individual, plastic cubes.) The other cupcake I tried was a PB&J Cupcake made with, yep, you guessed it, peanut butter chips and grape jellybeans. In lieu of a gumball topping the cupcake, this one had a peanut butter cup adornment. Iâ€™m not a stranger to “healthy” candy, nor are my views on it anything but direct: there really isnâ€™t such a thing. So if youâ€™re looking for a candy thatâ€™s going to be something I recommend you add to your diet, you can stop reading now. That said, I do believe there is a difference between candy and candy that is better for you. And with childhood obesity on the rise, more and more parents are looking for these sorts of confectionery avenues. Kids are always going to want to eat sweets, so you might as well buy them the ones that are not as hard on their bodies. Recently, I have reviewed products from companies that share this vision for candy, namely from Surf Sweets and BrightSpot, so itâ€™s not all that surprising to hear of more and more companies adopting this mantra. 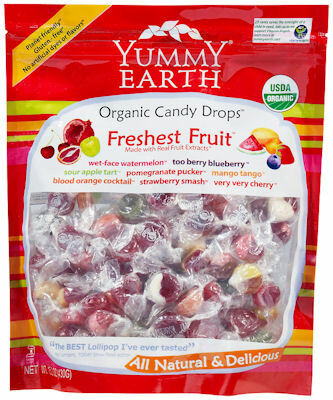 The latest comes from Yummy Earth, who proudly boast a tagline that their candy is â€œThe best stuff on earth.â€ Hmmâ€¦ Snapple anyone? The idea for this company is steeped in genuine love of both candy and children; the founders are two fathers who teamed up develop a candy for their children that didnâ€™t rely on all the additives, preservatives, etc. that are common in most American candy.